Hmm; one thing that kind of got lost in the shuffle about this Michael Phelps bong hit business ... smoking weed is still sort of illegal here. Especially in states like South Carolina. You may say that the infamous News of the World photos don't actually prove anything, but you take those (what was he hitting, Aquafina? ), and add Phelps' confession, plus eyewitness accounts that Phelps was "totally wasted all weekend," and you may just get a visit from Sheriff Buford T. Justice. Richland County Sheriff Leon Lott says he will charge Michael Phelps with a crime if he determines the Olympics hero smoked marijuana in Richland County. 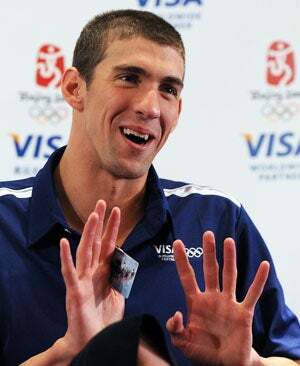 Phelps, who set a record with eight gold medals in the 2008 Summer Olympics, was photographed smoking a marijuana pipe at a November party in Columbia. Pot may not land you in jail where you come from, but you're in Richland County now, boy. Possession of marijuana is a misdemeanor, punishable by up to 30 days in jail or a $570 fine, plus court costs. However, simply appearing like you're stoned in South Carolina? That's still okay. Such as.